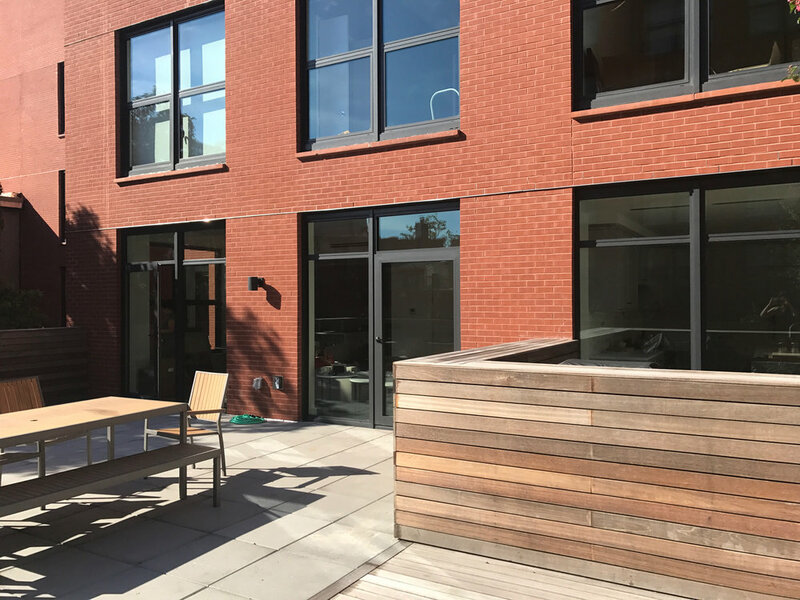 DESIGN WILD transformed a bare newly constructed condo terrace into a beautiful, low-maintenance garden space perfect for lounging, entertaining and for a new family to grow. 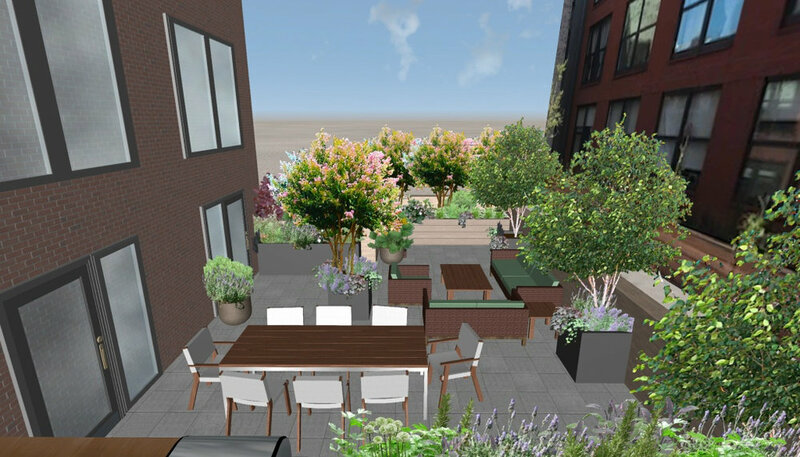 Working with the owners, we helped them envision what kind of spaces and feel they wanted on their terrace. We designed a plan to add some trees for shade, height and privacy; incorporating lush plants with varied textures; and organizing the space into 'rooms' for dining, relaxing, and enjoying the outdoors. 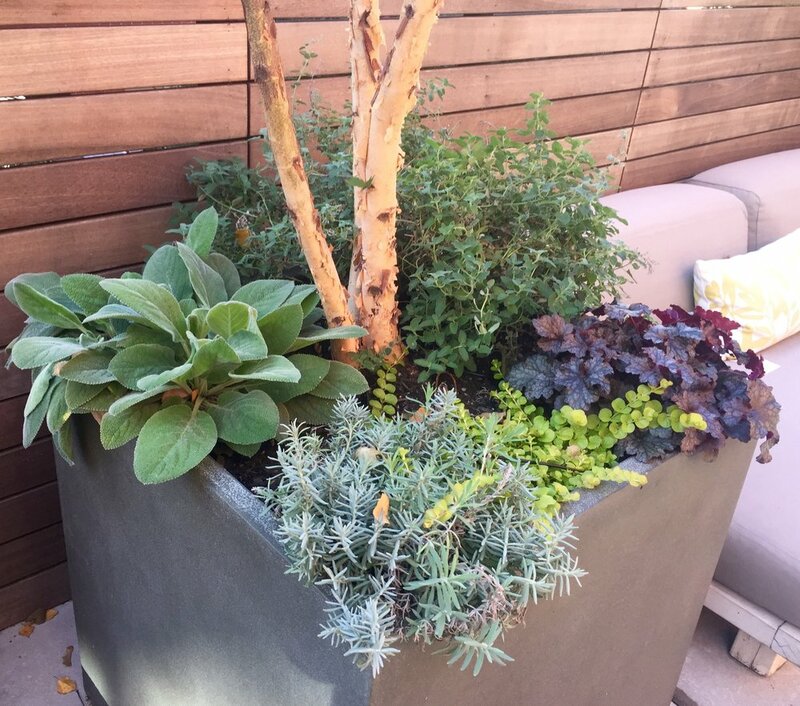 As for the plants, Design Wild incorporated some of our favorite color and textural combinations to fill out a variety of new planters. The soft, fuzzy "Lambs Ears" (stachys) on the left and the delightfully minty smell of the purple "Cat mint" (nepeta) was especially geared to bring a fun sensory experience to our clients' children. And of course the blueberries! We also knew that our client wanted a low-maintenance garden, as they were busy with the demands of a new family. Our resilient plant combos proved the test of time - when we made our first garden visit after almost six months, we were pleased to find our plants thriving! October 2017 | Our last visit at the end of the fall season. May 2018 | Our visit after six months! Look at that Nepeta go! And of course it wouldn't be Design Wild without a little nod to our love for growing food. We added these delightful window boxes to bring herbs and lettuces to the family.